If you are like the vast majority of people who make resolutions, you probably have either a weight loss or fitness goal on your list. 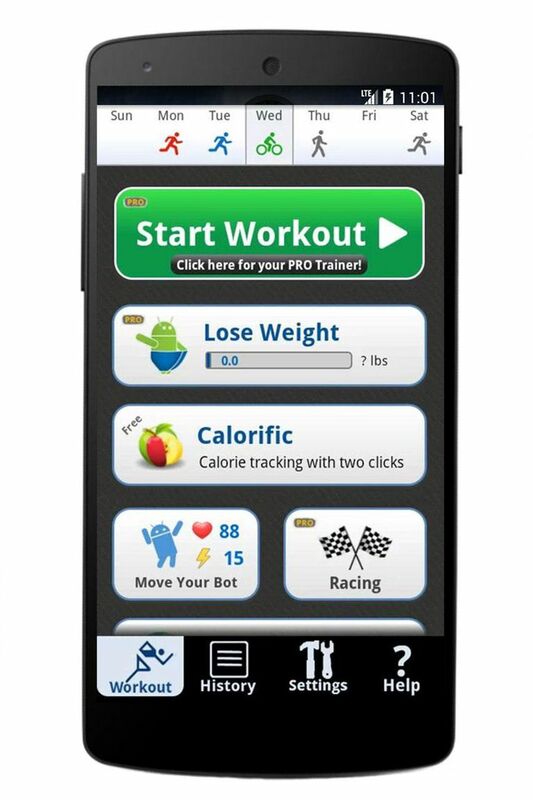 With the Cardio Trainer app for your Android phone, you can carry your training partner in your pocket wherever you go. There are many reasons why Cardio Trainer is a very popular Android app and after only a few minutes of exploring this app, you'll quickly see why it is so popular with fitness-minded people. Designed to record your walks, runs, and bike-rides, Cardio Trainer's mapping features are truly spectacular. The app is simple to use and provides the feedback and motivation that many people will find the perfect aid to their fitness goals. Just knowing what this app can do should be enough motivation to get you out from behind your desk and out on the streets! Just tap Start Workout when you are ready to hit the road and Cardio Trainer will begin mapping your every step. Using the GPS feature of your Android phone, the app will locate your position and will detail your path, recording distance, pace, calories burned, and total workout time. When your workout is finished, press End Workout to get an overview of your workout. You will be able to see a very precise map of your workout route, along with the details of your workout. Pressing the History tab from the Welcome screen will allow you to view the details and route of all your previous workouts. Spending just a few minutes to personalize the app's settings will provide a more accurate and detailed summary of your workout. Though the app has several settings and features, making sure that the basic settings are correct is your first step in making this app your own. Start with choosing whether you want your distance recorded in miles or kilometers. The default is to use miles but by simply de-selecting this option, the app will use the metric equivalent to record distance as well as your weight loss. You can also set the app up to automatically upload your workout data to the Google Health site. Adjusting the GPS/Pedometer settings are important to ensure an accurate summary of your workout. Set your stride length, the frequency of the GPS location intervals and the GPS filter. The higher the GPS filter, the more accurate your workout details will be. Considering how powerful and feature-rich the free version is, you may be wondering if spending the money for the Pro version is really needed. The Pro version offers two powerful features that are available only as trials with the free version. These two features, Lose Weight and Racing are what might convince you to go with the Pro Version. If your goal is weight loss, the more tools you have at your disposal the better. Using the Lose Weight tool of the app, you can set a detailed weight loss goal, along with your goal deadline and set workout reminders to keep you on track. Once you set your goal, the app will track your calories burned, workouts completed and you will be able to update your actual weight loss. The app will even provide some "risk level" feedback if your weight loss goal is too aggressive. The Racing option of the Pro Version is a powerful motivation tool. People who purchase the Pro version can compete against and track one another. You can also use it to encourage and motivate each other. This feature alone is reason enough for the Pro version and the weight loss goal is just low-fat gravy on top. All in all, Cardio Trainer and Cardio Trainer Pro are top fitness apps. For those who live in cold weather climates that occasionally makes outdoor workouts too challenging, the app allows you to enter indoor workouts as well. Go 3 miles on a treadmill and 20 minutes on an elliptical and record the information into the app. Your calories burned are recorded as are your distances and times. Updates are frequent but certainly not over the top. The app can be a battery drain since it relies heavily on the GPS feature of your phone but you can run the app in the background and have your display turned off to minimize battery drain. Lastly, the app allows you to play music while you're working out. This basic feature can provide an additional level of in-workout motivation and does not interfere with the audio feedback of the app. All in all, this is a fantastic app with wonderful features. If you are serious about your fitness or weight loss goals and need some motivation, Cardio Trainer is a fantastic choice and the Pro Version is well worth the investment. Disclosure: Review samples were provided by the manufacturer. For more information, please see our Ethics Policy. Always consult with your healthcare provider before starting any fitness program.